It’s natural to fear difficult conversations – however the truth is that when we practice compassion and treat each other with respect, the conversations rarely are as difficult as we expect. When we avoid difficult conversations the issue never has a chance to be resolved. Plus, as we play the stories over and over in our mind, the stories gets louder and the people in the stories become bigger and bigger villains. Having difficult conversations is an opportunity to build trust and respect. When we learn to build trust we also learn we can challenge each other without fear which means our relationships with other people and/or organizations improve greatly. Difficult conversations should have a structure and the following 8 steps will help you prepare. When you can’t prepare, fall back on what will soon become your great experience. Overall, stay positive, listen mindfully, be compassionate (don’t attack), and do not be defensive. Difficult conversations are rarely conflict situations until we make them that way. For example, you might be thinking “They are lazy,” when in reality they had other important priorities you didn’t know of. Then, decide if this is worthy of sharing or is this all about ‘you’ and something you need to work through on your own. Have you contributed to the problem? Take personal responsibility – own your own stuff. Stay positive, flexible and listen mindfully. If your purpose is honorable a few mistakes will be overlooked. Afterwards, evaluate how it went. What did you learn? Could you have done it differently? If this really is a difficulty conversation, the other person now has the choice to do something with the information you shared… or to do nothing. If this was a conflict situation, some resolution will have to be found. 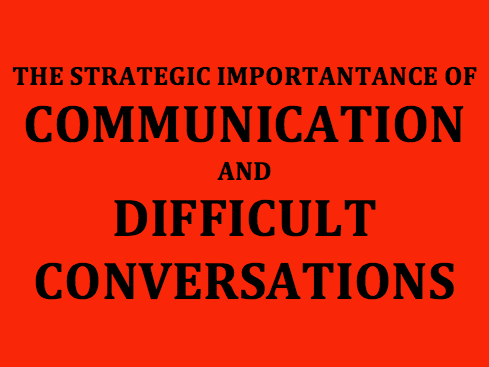 (I will discuss the differences between Difficult Conversations vs. Conflict in another next post). Having difficult conversations is vital to healthy, vibrant relationships. Get clear on your purpose – make sure your purpose is constructive and not about teaching them a lesson. If you get emotional, heated and off topic then it’s likely they will also get emotional. And finally, be comfortable being uncomfortable. Yup – difficult conversations will be uncomfortable. But, you are amazing. Your intentions are good and you are willing to be uncomfortable for the benefit of the individual, relationship and/or company.